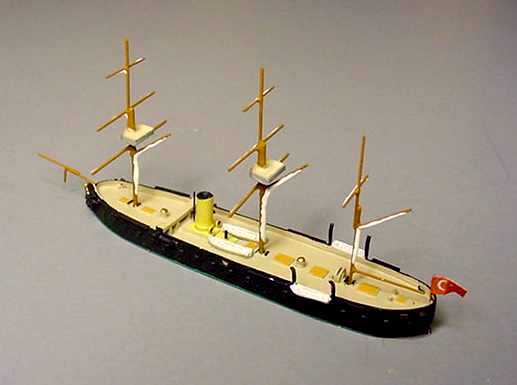 Overshadowed by the large manufacturers like Navis/Neptun, Albatros, CM etc., there are a number of dedicated expert makers of 1:1250 ship models such as JW. 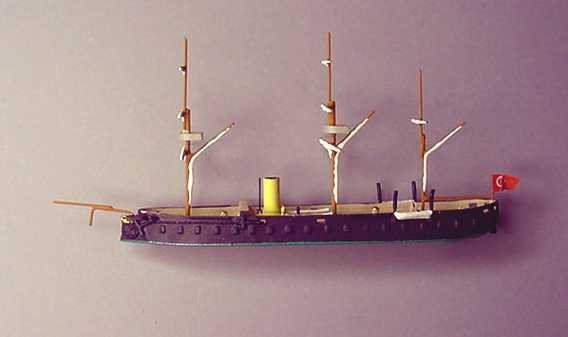 To attach a name to this artist: he is Johann Wolkersdorfer of Essen, Germany; a maker of ship models that fill a large gap in 19th century maritime history. My attention was drawn to his great models a couple of years ago by Ingo Hohm and/or John Olson, I think. The OSMANIYE is a typical British-built ironclad, broadside battery vessel in the manner of the HMS WARRIOR/GLOIRE revolution in naval design. I imagine that these ships were not sea-kindly under sail or power. Her size is smaller, like the HMS SHANNON or HMS PHOEBE. She has her sails furled and is flying the Turkish ensign (all JW models are flagged sharply, as all great models should be). 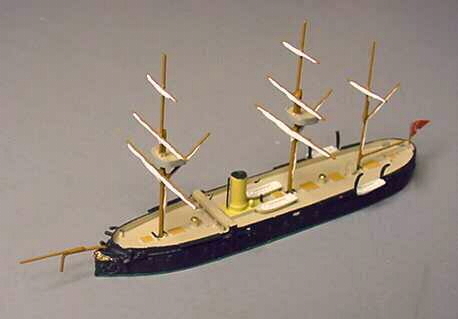 Her decks, hatches, and boats are fully painted and her bow is "gilded". She has 19 cleanly molded gun ports on each side, and she accommodates other guns as well (see armament list below). 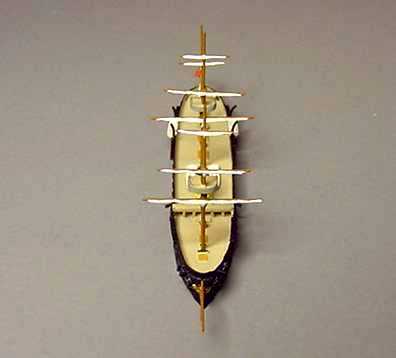 In the sail-to-steam warship model fleet, she can easily stand up or come along side of the Optatus ships of that period. My personal opinion is that Mr. Wolkersdorfer is a consummate artist with a great deal of skill and know-how who applies his gift to these great models liberally. Armament: One 229 mm cannon (9 inch); fourteen 203 mm cannons (8 inch); ten 36 pounders. Brief Synopsis: Sister-ships are: AZIZIYE, ORHANIYE, and MAHMUDIYE. The OSMANIYE was taken out of service in 1909 and sold in 1923.